Silver Valley Stories: Post #300-Was it a ghost? This week my assignment for my siblings went like this: Do you have any ghost stories to share? Interpret this however you would like. Inland Empire Girl's ghost story is here, and Raymond Pert's will be here when he is done. I wrote about some of my ghostly encounters here, but I remembered another story that I'd like to share. This one goes in the I'm not really sure what I saw category. A few years ago I started writing a historical fiction novel about the Silver Valley. As I was working on my research, I would occasionally walk along the Trail of the Coeur d'Alenes below our old house, and walk toward Smelterville, along where the Bunker Hill Company was located. One day I glanced back toward the hillside, and briefly caught sight of a man. He was around 19 or 20, dressed in black pants, and a white shirt, about 5 foot 6 or 7, with black wavy hair and darker skin, like that of some of Mediterranean descent. After seeing this brief vision of this man, my description of Antonio Albertini was born...the Italian immigrant who is one of the main characters in my story. I'm not sure if I just saw a shadow and developed the rest of the description in my mind, or if I really saw a young Italian man standing down by the old Bunker Hill Company. Either way, it helped me develop and formulate what Antonio would look like in my book, and also brought out some of his personality traits as well. Antonio is rather moody and brooding, but can have a good sense of humor as well. I've never caught sight of him again, though I have tried. Now he just resides in my head, being created and developed in there, and is also being developed on the written page to some day come alive on the pages of my book. 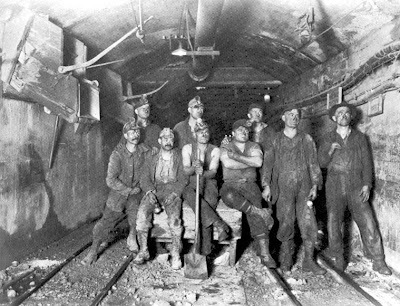 Perhaps it was one of these Idaho miners in this photograph. 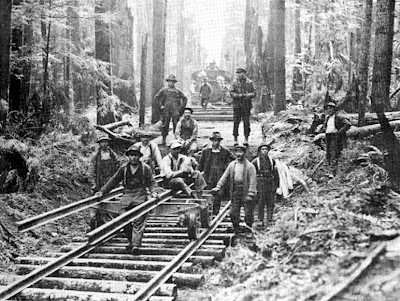 Or maybe one of these railroad workers from Washington state. Congrats on your 300th post. Isn't it amazing? I love to read your blog and learn things I never knew. You ghost story was new to me. Great post.